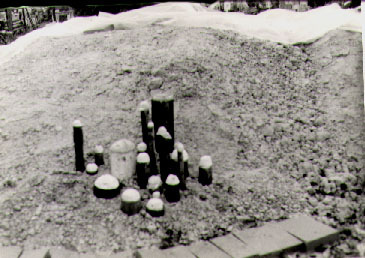 Seventeen years ago, 1990, I was given an assignment at Mason Gross School of the Visual Arts, New Brunswick, NJ to create an installation using clay, dirt, bricks..and this is what developed. Then, late October, 2000, a sunny day, I was invited by Paul Robeson School to create a low budget, no budget community project. Five years latter it has transformed from negative to positive in a wild leap. Pipe Dreams is a miniature industrial landscape. Generally, an industrial area can be ominous and out of our control. Things like pollution seem beyond us. Here, the viewer is the giant in control with a change in perspective and reversal of positions. A yellow brick road leads to the cluster of smokestacks, suggestive of the Wizard of Oz and Dorothy's search for answers or any road at all.